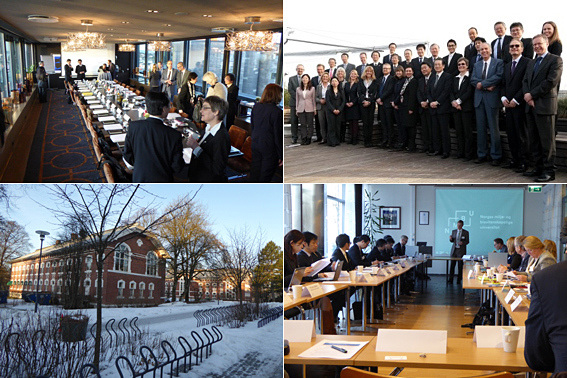 The 5th Japan-Norway Joint Committee Meeting (JCM) on cooperation in science and technology was held in Oslo on February 11th, 2015. The Japanese delegation attending the meeting consisted of representatives from ministries, funding agencies, and research institutions led by H.E. Makoto Katsura, Ambassador for Science and Technology Cooperation of the Ministry of Foreign Affairs (MOFA) of Japan. Mr. Kubota (Deputy Manager, Dept. of Foreign Affairs) and Mr. Kato (Director, Paris Office) participated in the JCM from JST. The Marine Research Seminar was held the next day at the Norwegian University of Life Sciences. JST President Michiharu Nakamura visited Israel as a member of Japanese delegation accompanying Prime Minister Shinzo Abe’s tour in Middle East. 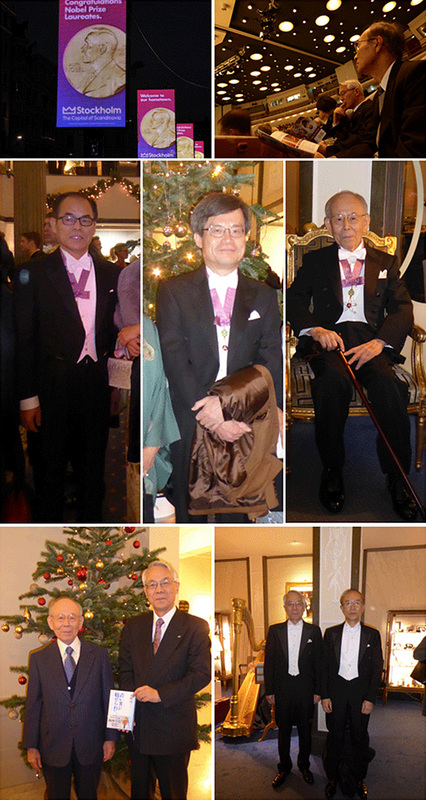 Dr. Michiharu NAKAMURA (President of JST) and Mr. Akio ISHIDA were invited to the Nobel Prize Award Ceremony and Banquet held in Stockholm on 10 December 2014, where Prof. AKASAKI (Meijyo University), Prof. AMANO (Nagoya University) and Prof. NAKAMURA (University of California, Santa Barbara), the 2014 Nobel Prize Laureates in Physics, presented their research and received their Nobel Prize from King Carl XVI Gustaf of Sweden. Since 2009, the École des haute études en sciences sociales (EHESS) Franco-Japan Foundation has aimed to promote intellectual exchange between Japan and France through the organization of conferences and international meetings and by contributing to the development of new research programs. The EHESS France-Japan Foundation established the Center for French-Japanese Advanced Studies of Paris (CEAFJP) as a research and exchange program for Japanese researchers and international scholars on Japan. JST will continue to promote future cooperation in the social sciences with CEAFJP. CONCERT-Japan "Connecting and Coordinating European Science and Technology Development with Japan", coordinated by the Scientific and Technological Research Council of Turkey (TÜBİTAK), is an ERA-NET project funded under the International Cooperation (INCO) area of the Capacities Programme of the EU 7th Framework Programme for Research and Technology Development (FP7). The Final Conference of the CONCERT-Japan Project was organized on 1-2 December 2014 in İzmir, Turkey, by TÜBİTAK. There were roughly 40 participants from the funding organizations that participated in the Project from both Europe and Japan. The Project started on 1 January 2011 and lasted for four years until 31 December 2014, with a budget of over 2 Million Euros. Thirteen multilateral collaborative research projects have been funded through two open calls in the thematic areas of of “Resilience against Disasters”, “Efficient Energy Storage and Distribution” and “Photonic Manufacturing”. The Project consortium included ministries and research funding agencies from Japan, France, Germany, Hungary, Italy, Norway, Spain, Switzerland and Turkey. The Final Conference was followed by a final Steering Committee meeting and the Kick-off Meeting of the European Interest Group (EIG) for Japan the following day. The winter 2014 DOI Strategy Meeting was held in Milan, Italy, on November 20th, 2014, co-organized by the International DOI Foundation (IDF) and Multilingual European DOI Registration Agency (mEDRA). Mr. Mizuno (Director, JST) attended as one of the board members of the Japan Link Center (JaLC) to provide updates on their activities. JaLC is a service that registers DOI and manages bibliography and location information of electronic academic content. The DOI Outreach Conference 2014 was organized the following day, on November 21st, 2014, by mEDRA directed at the public. JST promotes dissemination of scientific and technological information by running the JaLC which provides sustainable access to Japanese electronic scholarly content. The CONCERT-Japan Workshop on EU/AC-Japan Energy Research was held in Julich, Germany, from October 16th to October 17th, 2014, co-organised by the Research Centre Julich, ZENIT GmbH (Centre for Innovation and Technology in NRW) and the Ministry of Innovation, Science and Research of the German State of North Rhine-Westphalia (MIWF NRW). 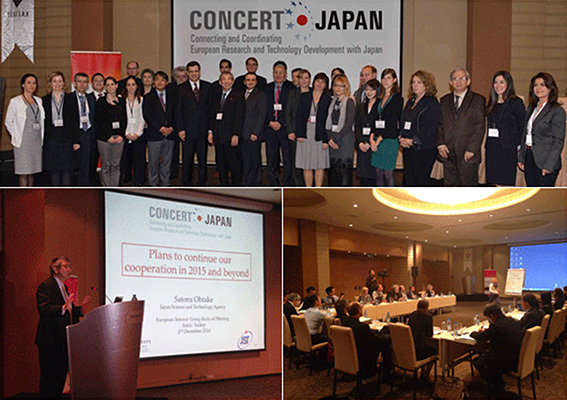 Subtitled as “Results and prospects of projects funded under CONCERT Japan”, the workshop began with an overview of the achievements of four different energy projects which have been in operation since April 1, 2013 under the CONCERT-Japan program. Participants including project partners, the funding organisations of the respective projects and other policy-making organisations then went on to exchange ideas at a roundtable aimed at identifying advantages, challenges and expectations in the CONCERT-Japan projects for sustained research cooperation in the energy field between the EU, accession countries and Japan. Dr. Nakamura (President, Japan Science and Technology Agency: JST) and Dr. Fuchs (President, le Centre National de la Recherche Scientifique: CNRS) signed a Memorandum of Cooperation (MOC) in Kyoto, Japan. This new contract will renew the scientific and technical cooperation for another ten year period. Drs. Isamu Akasaki, Hiroshi Amano, and Shuji Nakamura win the Nobel Prize in Physics 2014. JST provided support for Dr. Akasaki’s research from 1987 to 1990 and another from 1993 to 2000 in its Contract Development program and Dr. Nakamura’s research from 2001 to 2006 in its ERATO program. JST also supported Dr. Amano’s research from 1993 to 2000 and another from 2007 to 2010 in its Contract Development program, and it has continued to support his most recent research in its Super Cluster program since 2013. 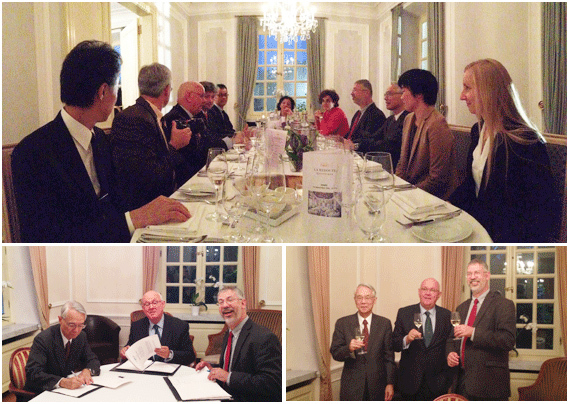 UK-Japan Research and Collaboration Day was held in Newcastle in the UK on October 2nd, 2014, organized by Newcastle University. 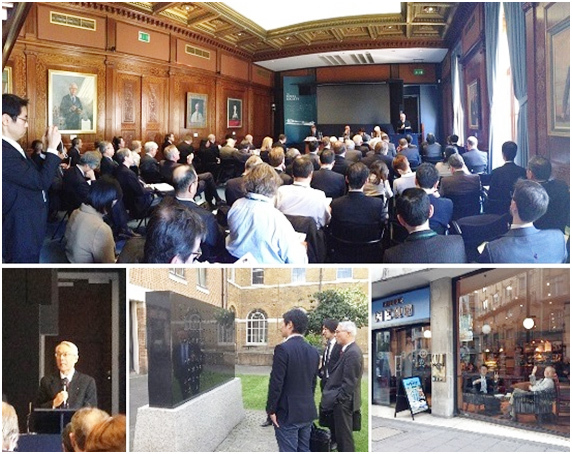 Participants included representatives from the Embassy of Japan in the UK, the Japan Society for the Promotion of Science, JST, the Daiwa Anglo-Japanese Foundation, the Japan Foundation, the Great Britain Sasakawa Foundation and Osaka University. The JST Paris Office made a presentation and introduced various funding programs as possible mechanisms for collaboration with Japanese partners. Dr. Nakamura (President, JST) and Dr. Nakajima (Manager, Dept. of International Affairs) visited the Lyon Smart Community where the New Energy and Industrial Technology Development Organization (NEDO) has been supporting a project demonstrating Japan's cutting-edge technologies to be introduced for the optimization of energy utilization in the region. 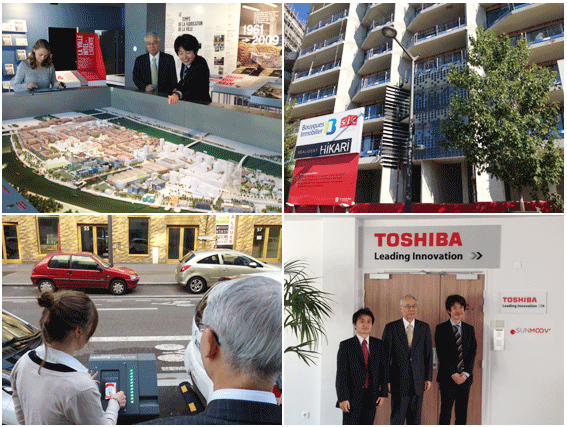 TOSHIBA Co. is one of the main companies conducting this project, and we visited its Lyon office. We also visited the National Institute for Applied Science (INSA Lyon) where there is a Tohoku University liaison office, and discussed research collaboration between Japan and France. Dr. Nakamura (President, JST) signed a Letter of Interest concerning co-funding of a program on software development for exa-scale computing with Dr. Strohschneider (President, German Research Foundation: DFG) and Dr. Matlosz (President, French National Research: ANR) in Bonn, Germany, on September 24th. Under the framework of the "Software for Exascale Computing (SPPEXA)" program which is implemented by DFG, JST and ANR will support trilateral projects based on this agreement in the future. JST will provide research funding for Japanese researchers through the Strategic Basic Research Program CREST. 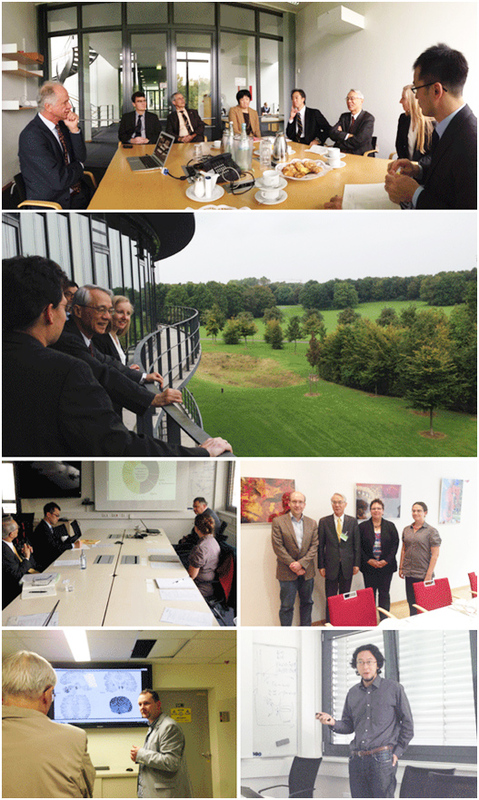 The JST delegation also visited the Center of Advanced European Studies and Research (CAESAR) and Forschungszentrum Julich (FZJ) on this occasion. JST signed a Memorandum of Cooperation to promote research cooperation with four public agencies in V4 countries (Czech Republic, Slovak Republic, Hungary and Poland) and the International Visegrad Fund (IVF), in Bratislava on September 23rd, 2014. The signing ceremony was conducted at the Embassy of Japan in Slovakia, and representatives from the Czech Ministry of Education Youth and Sports (MEYS), the Hungarian Scientific Research Fund (OTKA), the Polish National Research and Development Center (NCBR), the Slovak Academy of Sciences (SAS) and IVF attended the event. Slovakian government officials as well as the Ambassadors from the Czech Republic, Hungary and Poland also participated in the ceremony. Based on the agreement, future co-funding for multilateral joint research and workshops will be carried out, and this collaboration is expected to yield exciting new innovations between the V4 countries and Japan. Dr. Nakamura (President, JST) visited Bratislava, the capital of the Slovak Republic, and gave a lecture on “Vision of Japanese Science for the Near Future” at the QUTE Pavilion, a lecture hall of the Slovakia Academy of Sciences (SAS). Welcome and opening remarks were made by H.E. Egawa (Ambassador Extraordinary and Plenipotentiary) and Dr. Majkova (Vice President, SAS), and more than fifty people attended the seminar. Interest in the science and technology policy of Japan in Slovakia is high, and enthusiastic discussion followed Dr. Nakamura’s lecture. Dr. Nakamura and his colleagues, Dr. Nakajima (Manager, Dept. of International Affairs) and Ms. Miyashita (Chief, the same) also visited the Institute of Physics, Institute of Electrical Engineering and Polymer Institute after the lecture. 2nd V4-JST Workshop on "Advanced Materials"
The 2nd V4-JST Workshop on Advanced Materials was held in Warsaw of the Republic of Poland, co-organised by the Warsaw University of Technology and Japan Science and Technology Agency (JST) from September 17th to September 18th, 2014. The workshop was held to follow on from the success of the 1st V4+Japan science and technology workshop in July 2013 in Slovakia. In total, 26 researchers from Japan and the V4 countries (Slovak Republic, Czech Republic, Poland and Hungary) presented their research at the workshop, which consisted of 4 sessions (Materials for extreme environments, Biomaterials, Materials for electronics and energy harvesting and Lightweight construction materials). Dr. Tonomura (Executive director, JST) attended to endorse the event and the upcoming call in the V4-Japan collaboration. 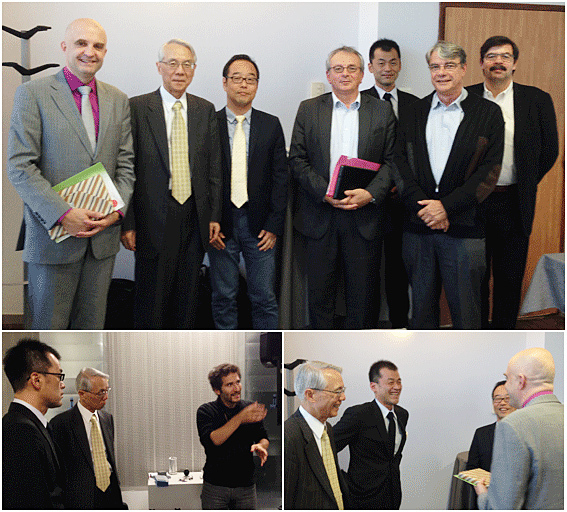 Mr. Ohtake (Senior Executive director) and Mr. Tsuda (Director, Research Institute of Science and Technology for Society, RISTEX) visited Paris to meet with several agencies to discuss potential future collaboration in the field of social science; specifically, for supporting integrated research through the participation of social scientists. They visited the International Social Science Council (ISSC) and L'Agence nationale de la recherche (ANR) to introduce the activities of RISTEX and exchanged views on the importance of social scientists’ involvement for implementing Global Environmental Change research. They also visited L'Ecole des hautes etudes en sciences sociales (EHESS) and discussed active ways to encourage the exchange of social scientists between Japan and France. An international joint symposium in 2015 was agreed as first step toward future collaboration. Mr. Kato (Director, JST Paris Office) attended a Satellite Meeting (JEUPISTE Project Training) of the 5th INCO Conference (Athens, 3rd June) to introduce JST’s activities and international collaboration programs, especially those between European countries and Japan. Mr. Kawamata (Director for Special Missions, Strategic International Research Cooperative Program) and Ms. Miyashita (Chief, Dept. of International Affairs) visited Poland, Hungary and Slovakia to discuss potential future multilateral collaboration in the field of science and technology. They visited candidate collaboration partners including the International Visegrad Fund (IVF), the Slovakia Academy of Sciences (SAS), the Hungarian Scientific Research Fund (OTKA), the Hungarian National Innovation Office (NIH) and the Polish National Centre for Research and Development (NCBR) to introduce the funding mechanism of the joint research program between Japan and the Visegrad four (V4) countries. Dr. NAKAMURA (JST President), Mr. OKIMURA (Adviser), Ms. ASANO (Chief, Dept. of Innovation Research) and Mr. MINOWA (Chief, Dept. of International Affairs) attended the workshop and council meeting of the Science and Technology in Society (STS) Forum held in London, the United Kingdom. They also visited the University of Cambridge, the Engineering and Physical Sciences Research Council (EPSRC), the Centre for Integrative Systems Biology and Bioinformatics (CISBIO) at Imperial College London and the Hitachi Cambridge Laboratory, in order to further understand state-of-the-art research trends in the United Kingdom.